Flatpack Assembly | Assembly Instructions | Space required to install sliding door wardrobe? Flatpack Delivery and Assembly Specialist! Adequate assembly space is crucial to build any flat-pack furniture correctly and professionally. You would be surprised how many flat pieces are packed in a small box with many different types of fittings and fixtures, needs to be assembled. To build a flatpack furniture requires extra space, then the actual furniture size itself. For example, there should be a minimum of 60cm walking space available around the product, when assembled lying flat. Some of the flat pack furniture (e.g sliding doors Wardrobe) is not even possible to build, if there is not enough clear space available. Following images could be helpful to understand the space requirements, before you consider buying or start building a flat-pack. Please select the type of furniture needs to be build. 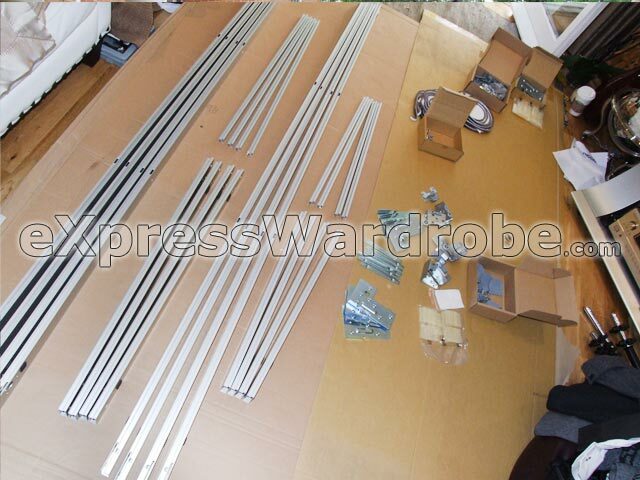 Typically sliding doors come in kit form » Image ». Each door has more than 100 unbelievable components; which needs to be assembled on site. Usually it takes our fitters about 20 to 30 minutes per door to build. Space restriction may extend assembly duration. © eXpress Wardrobe. All rights reserved.